SINGAPORE, 23 May 2014 – Singapore Changi Airport handled 4.38 million passenger movements in April 2014, a growth of 3.4% compared to the same period in 2013. Flight movements increased by 3.0% to 28,400. During the month, 151,100 tonnes of airfreight were processed at Changi, a 0.6% increase year-on-year. The growth in passenger traffic was supported by an increase in air travel between Singapore and all regions except the Americas. Among Changi Airport’s top 10 country markets, passenger movements to and from Hong Kong, India, Indonesia and Japan registered double-digit increases. However, Thailand and China traffic registered declines of 15% and 8% respectively. On a rolling 12-month basis, passenger traffic at Changi Airport crossed the 54-million mark for the first time in history with 54.02 million passenger movements recorded for the year ended 30 April 2014. 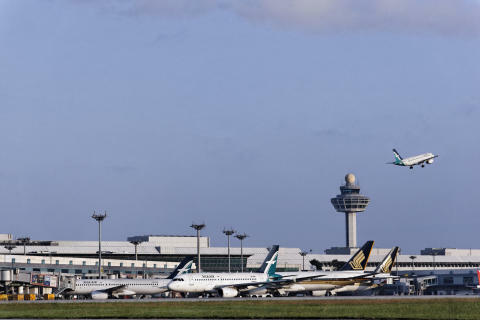 As at 1 May 2014, more than 100 airlines operate at Changi Airport, connecting Singapore to 270 cities in some 60 countries and territories worldwide. With more than 6,600 weekly scheduled flights, an aircraft takes off or lands at Changi roughly once every 90 seconds. New Airlines – Uzbekistan Airways (IATA: HY) launched Singapore’s first direct air link to Central Asia on 4 April, operating a twice-weekly circular routing service between Tashkent and Singapore. Tashkent is a new city link for Changi Airport. Another new carrier at Changi, Spring Airlines (IATA: 9C) launched a thrice-weekly Shanghai-Singapore service on 25 April. With the commencement of its service, Spring Airlines is the first low-cost carrier to operate this route. New Services – On 21 April, AirAsia launched a four-times weekly service to Kota Bharu and subsequently, a thrice weekly service to Kuala Terengganu on 22 April. New Stores – Kaffe & Toast has opened its second halal outlet at Terminal 2’s Arrival Hall. Airport visitors can enjoy a variety of traditional toast and drinks, including all-day dining of favourite local dishes such as Curry Chicken, Nasi Lemak, Laksa and Mee Siam. Over in the transit areas, Singapore-based luxury tea company TWG Tea opened its second tea boutique in Changi Airport. Located in Terminal 1’s Departure Transit Lounge, passengers have a range of exotic teas or tea-infused macarons and chocolate bonbons to choose from.